Though we came to Kenya and Kibera as outsiders and strangers, we left as friends and family. Without that sense of openness, graciousness, and community that was extended to us from the very beginning, I know that this experience for me would not have been nearly as impactful. As the mission statement for Carolina for Kibera reads, “CFK exists to develop local leaders, catalyze positive change, and alleviate poverty in the informal settlement of Kibera in Nairobi, Kenya”, all while taking a participatory development approach. Before traveling to Kibera, I was asked several times what participatory development meant to me. A quick Google search will tell you that this is an approach that seeks to engage local populations in development projects. A broad and somewhat vague description, yet a concept that deeply resonates with me. Coming out of my first year of my Master of Social Work program at UNC, it had been impressed upon me for the previous 8 months that “people are the experts of their own lives”, meaning that no matter how much I may think I know, an individual ultimately knows what is best for their own life and has the inherent right to self-determination. Furthermore, Social Work as a profession stresses that in order to create sustainable, lasting positive change, solutions must be community-driven and that it is our role as Social Workers to facilitate and support that change. Ashley with fellows and interns outside of CFK's Binti Pamoja Center in Olympic Estate, Kibera. The overlap between Carolina for Kibera as an organization and my values as an individual and future Social Worker was apparent from a precursory look through the website. I knew immediately that being part of such an organization and (hopefully) making meaningful contributions was how I wanted to spend what will likely be my last summer before once again entering the workforce. However, as our departure neared, I began struggling with how I, as a complete outsider to this community, could possibly contribute to such a community-based grassroots organization in a participatory fashion. Sure, the words sound nice, but how was I actually going to live that out? For many students (myself included), our natural inclination is often to jump right in, heads first, to begin working on projects and creating deliverables for supervisors. As you might be able to guess by now, to do this would be in direct contrast to the mission and guiding principles of CFK. I worked to tamp down this instinct in myself during the first days of work, and instead sought to ask questions, listen to understand, and hear experiences of those infinitely more knowledgeable than myself. 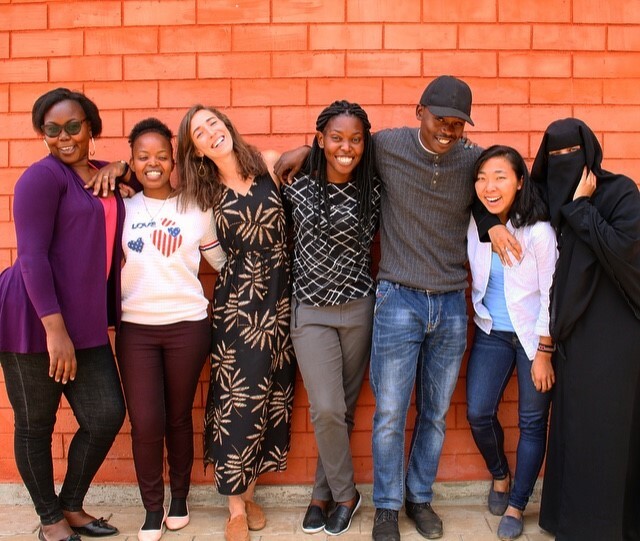 Over the course of my short 8 weeks with Carolina for Kibera, I was fortunate to work in some capacity with nearly every program offered – Maternal and Child Health, Nutrition, Girls Empowerment, and Education. Much of my work here revolved around the development of tools which could be used to monitor the growth and success of these programs, and thus required conversations with program participants at all levels – from program managers to community health workers to community members that would be recipients of these services. I was able to travel to different villages within Kibera to attend educational trainings and community events, and even hosted a training of my own (which would not have been possible without the help of my fellow coworkers!). Though I learned so much from a professional perspective and am beyond thankful for the numerous opportunities that were presented to put the skills I had been learning in the classroom to use, my greatest lessons in participatory development came from my interactions with the staff of CFK and the community members whom I was fortunate to get to know. From the moment we stepped off the airplane, someone was there to pick us up, show us to what would be our home for the duration of our stay, and answer what I’m sure were our never-ending questions about life and work and culture. They took us to lunch at the best local spots, camping and hiking on the weekends, and football games that won’t soon be forgotten. Though we came to Kenya and Kibera as outsiders and strangers, we left as friends and family. Without that sense of openness, graciousness, and community that was extended to us from the very beginning, I know that this experience for me would not have been nearly as impactful. CFK has shown me what true participation looks like and this spirit is something I hope to carry with me in all of my future endeavors. I am forever grateful for the opportunity to have lived with, worked alongside, and learned from such an incredible team.